Closing Time… Don’t miss out on your last chance to bid on The Maison Leroy zCollection! All wines were purchased directly from Leroy, provenance does not get better than this! This HK zCollection will close at 10pm HKT tonight. 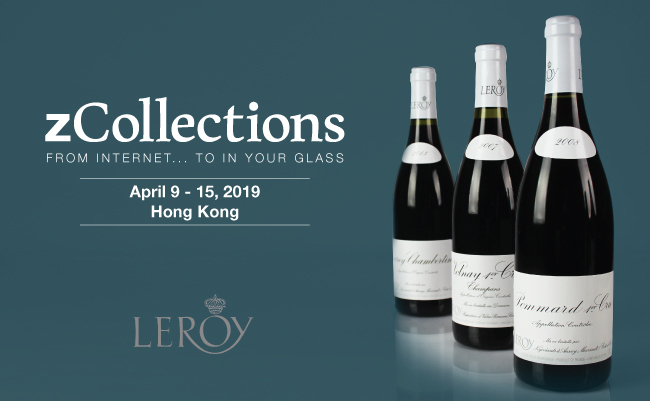 All wines featured in this zCollections are in Hong Kong. Zachys offers FREE consolidated sea shipping between Hong Kong and New York several times a year. Local delivery charges will apply. Please email asia@zachys.com for more information. Zachys offers special consolidated air shipping between Hong Kong and New York at a discounted rate of US$84 per 9L. These containers generally depart three weeks post auction. Local delivery charges will apply. Please email asia@zachys.com for more information.